The University of Alabama at Birmingham Department of Psychology and Lindamood-Bell Learning Processes conducted a randomized controlled trial involving children with Autism Spectrum Disorders (ASD). This experiment investigated the constructs of Dual Coding Theory (DCT) using the Visualizing and Verbalizing (V/V) program to develop oral and written language comprehension. Translational functional magnetic resonance imaging (fMRI) was used to study the effect of V/V on sentence comprehension, brain activation, and functional connectivity. Children with ASD typically have weaker connectivity, or underconnectivity, in the areas of the brain associated with language. Before and after instruction, children’s brains were scanned and they were administered a reading comprehension test. A similar group of children with ASD went through the same procedures but did not receive V/V instruction (i.e., control group). Children in the V/V group received approximately 200 hours of instruction over a 10 week period of time. Instruction was delivered by specially trained Lindamood-Bell staff. 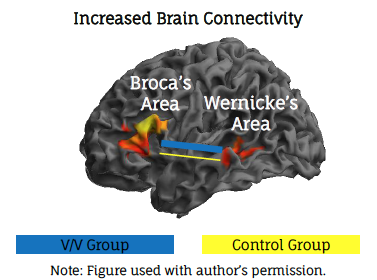 The figure below shows increased brain connectivity between Broca’s and Wernicke’s language areas for the V/V group (thicker blue line) compared to control group (thinner yellow line) during a task of visual imagery sentence comprehension. The thickness of the lines represents the magnitude of connectivity between the two brain areas. The strength of connectivity was significantly greater (p < .05) for the V/V group. In addition, the V/V group also had a significantly larger change (p = .05) in reading comprehension than the control group (13.9% and 3.9% respectively). Furthermore, researchers found a significant positive correlation between improvements in reading comprehension and brain activation. The results of this study illustrate that instruction in the Visualizing and Verbalizing program supports the Dual Coding Theory model of cognition, leading to greater brain connectivity and improved comprehension for children with Autism Spectrum Disorders.